I hope you'll enjoy my other stories about the artificer bird character -- I have one forthcoming in Realms of Fantasy, and one in the Clockwork Phoenix 3 anthology, as well as three (!) more in the works. Another thanks for the mention! Interesting trivia here, it was Shweta Narayan who illustrated my story Otto's Elephant for the Clockwork Jungle Book. How's that for multi-talented eh? 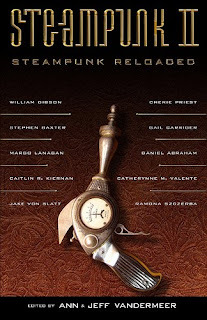 I couldn't be happier that her tale will be appearing in Steampunk Reloaded.